As the global recession takes hold, governments around the world have – with varying degrees of reluctance or enthusiasm – found themselves taking centre stage. This is usually seen as a case of dangerous times requiring special measures. Many commentators and practitioners impatiently await the opportunity to return to what they see as business as usual, so that governments can safely be put back in their boxes. This is, however, to misunderstand what has happened. The current role of government is not an unfortunate aberration. The recession has revealed an abiding truth – that the market can deliver its unmatched benefits only if governments are there when needed to make good its deficiencies and act against its excesses. The plunge into recession illustrates what happens when market operators become so powerful that governments are unable to restrain market excesses. And the response we now see to recession shows that governments can act to correct market failure in ways that the market, left to itself, cannot. Economies are robust things. They would recover sooner or later without intervention. But – as all but the most purblind now recognise – governments can significantly hasten the recovery process, and thereby limit the misery that recession inevitably brings about. The reason for this is that only governments can counter the inevitable tendency of recessions to feed on themselves. For most actors in the economy, the demands of self-interest mean that, in a recession, they spend less, invest less, cut costs, employ fewer people. Each individual decision may be rational and justified, but the cumulative effect for the economy as a whole is that recession is intensified. There are those who say that governments should act as though they were individual people or companies. According to this view, governments in a recession should also cut costs, spend less and lay people off. But if governments behave like everyone else, the economy is condemned to a deeper and harsher recession than needs be. Those holding this view are so blinded by an ideological hostility to the very idea of government as to deny Keynes’ statement of the obvious – that governments have a unique responsibility to act counter-cyclically. Only governments have the capacity and the duty to defy market logic. Only governments have the resources to over-ride what would normally be market-based self-interest and to substitute for it the wider interest in getting the economy as a whole moving again. Only governments can afford to live with long-term indebtedness if that is what is required in the interests of their shareholders – for which read everyone. Government intervention, whether to underpin the liquidity of the financial sector or to stimulate demand in the real economy, may well be necessary if recovery is to be hastened, but it is – importantly – more than a singular response to a singular problem. It is a statement of a wider and ever-present relationship between governments and markets. Markets function best – indeed only function properly at all – if government is ready and willing to second-guess market outcomes. What is true of the economy as a whole and of financial markets is equally true of markets in general. If, for example, we are to save the planet, market regulation will be needed in place of the unrestrained exploitation of natural resources. There are of course those who would at this point throw up their hands in horror. For them, the debate is about absolutes. The alternative to the unfettered market is state socialism. They do not see that to recognise and correct the deficiencies of the market is the best guarantee that a market economy can sustain itself efficiently and beneficially. The recession has laid bare and illustrated in other words that the readiness of government to intervene is the essential condition on which the market can be made compatible with democracy. The whole point of democracy, after all, is that it ensures that the wider and longer-term interest is brought to bear so that the often harsh and unfair outcomes of unfettered market operations are softened and made more acceptable. That is what governments are for. If the market is infallible and must never be challenged, there is no role for democracy. 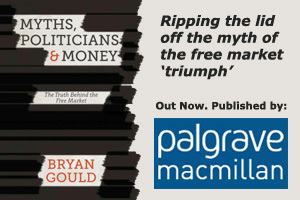 Governments are then merely bit players and democracy merely a sham – a cosmetic trick to provide the illusion that the rich and powerful can be made to account for themselves. As Rahm Emanuel remarked, a good crisis should never be wasted. We can profit from this recession if we draw from it the important lesson that the legitimacy conferred by the democratic mandate empowers and requires government to ensure that personal and sectional interests must not prevail over the general interest. There can be no return to the fallacy that the “free” or unfettered market establishes a kind of economic democracy that renders democratic politics irrelevant. The recession and the need for a government response to it may be, one hopes, an exception, but the value of the proposition that democracy rules is a constant.